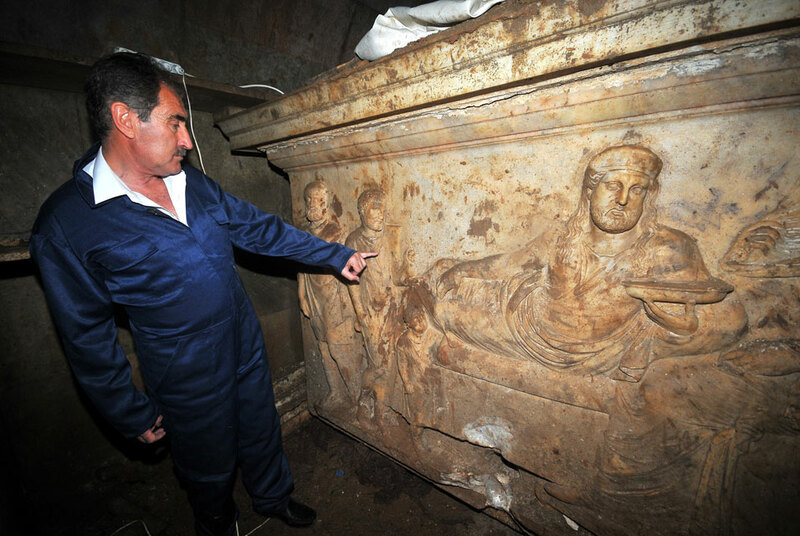 Here’s some more information on the discovery of King Hekatomnus’ tomb in Milas, Turkey. Police searched a home the looters were using and found 2 tunnels leading to the tomb. Inside the tomb they found not only a large and elaborately carved sarcophagus, but also frescoes and possibly more easily portable treasures that they promptly sold on the black market. A court has arrested and charged five of 10 people detained in the raid, the state-run Anatolia news agency reported. Anatolia, which was allowed to enter the tomb, said the suspects had dug two tunnels — 6 and 8 yards long — from the house and an adjacent barn, leading to the tomb that is buried about 10 yards deep. They used sophisticated equipment to drill through the thick marble walls of the tomb and were working to remove the coffin from the underground chamber. So I gather then that the tomb is a marble structure, not just a grave. Maybe it was an inspiration for his son Mausolos’ famous excess. Culture Minister Ertugrul Gunay noted that these looters weren’t some fly-by-night amateurs with shovels. They had funding and access to specialized equipment. Turkey intends to follow the money, investigating any potential international links. Gunay has also ordered further digs on the site and in nearby areas.